Used a Portaband mounted in the SWAG Offroad table. Very handy tool. Do the plywood side panels fit into the slots of the extrusions or are they fastened in a different way? Richard, that swag table looks great. If there was a taller maxi, you could store your portaband, table, and still have room for parts. Does the table use some sort of wingnut to hold the legs on? The slot in the extrusion is 5/16", I just rabbeted the side panels. For the top I used rabbeted strips and screwed up into the top panel from below, it sits about 1/2"above the 80/20. Check out their videos for more info, the newest version lets the newer saw just slip in. Older versions fit different saws, mine uses their throat plate to replace the stock one but then the saw slips in/out of the table for handheld use. Once again, I have tuned in a bit late. Somehow, this thread slipped past my view. When i got to the green egg portion of the discussion, I got to laughing. The part about using concrete in the bottom brought back an on the job experience from nearly 50 years ago. (49 to be a bit more precise) One more chance for me to bore the ---- (insert your own words) out of y-all. I had a contract to do the masonry on a development of some quite large houses. The project was being constructed over some reclaimed marsh (wetlands) and we had some problems to solve concerning possible future settlement. Instead of digging footings, we went in with a couple of dozers and pushed out a few feet of soft ground (peat) until we hit solid base. we then brought in about 3 to 4 feet of bank run gravel, compacting with a large roller as we went. Instead of wide footings, we put forms around the perimeter of the structure to be, layed out mesh and rods. The rods were on about 12" centers in both directions and wired together with the mesh tied over that. We poured the complete floor about 12" thick with extra reinforcement wherever a foundation wall was going above. A couple of the houses were being constructed during a very cold winter and we had to keep the gravel base protected until the concrete had been poured. Once the concrete was poured, we still had to protect the surface. We covered with hay and tarps over nite, uncovering only the area we would be working on by day. The foundations were concrete blocks (that, and all other unit type masonry were my part) and we needed to heat water and sand for the mortar. We had been off the project for about a week while the slabs were being poured and supposedly covered by the concrete contractor. I had sand, cement and lime delivered before the slab had been poured. My materials were well protected, but we had to bring in water in some 50 gallon drums. I gave my crew directions to set up some blocks next to the sand pile so we could build a fire under a drum. With warm water, we did not need to heat the sand other than reflective heat from heating the water. I left it up to my guys to take care of the setup while i went to a meeting with one of my other builders. When i arrived at the job, the first sight was of a water drum elevated over a roaring fire out on the very middle of the concrete slab. The slab had not been covered with anything but some tarps. No hay or insulating material any kind. The crew was busy with shovels and wheelbarrows moving the sand out onto the slab as close to the fire as possible. I jumped out of the truck yelling to get that fire out of there. Now, normally, i am just a quiet guy , but sometimes one has to get a little excited. It wakes people up when you yell a little . "What are you yelling about?" somebody asked. Just about the moment i was about to explain what could happen to cold concrete with a very hot fire burning away on it's surface, there was a loud blast as the entire 50 gal drum flew about ten feet in the air turning upside down and dumping its entire contents onto the fire. "That's why I was yelling!" Luckilly, no body was standing close to the fire, as there were some rather large chunks of concrete lying in a circle about 4 to 5 feet out from where the fire had been. Luckilly, the heat had not penetrated down far enough to affect the rod and wire reinforcement. The architect looked it over and with a little jack hammer and sawing work, we were able to put a neat patch in place. About the responder a page or so back who recommended concrete and wire for a base under the fire, I, for one, don't think so. A picture a little later on showed a pulverized stone pad that shows very graphically what can happen. Of course, that was probably not as exciting as my water drum flying sky high with enough water to extinguish a huge bonfire once it reached its full altitude and turned upside down. There was a lot of sizzling for a few minutes. Nobody was hurt and the expense turned out to be minimal. And, we all got a good laugh >>> sometime after I cooled off. Please excuse me, first time posting photos. Dog House: Additional, seldom used puppies in orange container to right rear. Jig standing in middle-back of dog house locks 1515 to MFT. Dog House on 1515 on MFT. Note "lock" underneath 1515. Dog House + lamp stand to left and another to rear + battery charging station to rear + saw platform to right All on 1515. Another view of saw platform. Nice set up I like that ,what are the dogs with the gold coloured screw on the side for ? Those dogs are from well know breeder John of Tool Improvements fame. What you see is a 1/4-20 knurled and plated wing nut. The other side of the dog has a flat face with a vertical slot so a fence or jig can be bolted to the dog, through the slot, at various heights. And I think you are fortunate to have several sets, John kinda retired and sailed off into the sunset, as least as far as dog-breeding is concerned. A "Dog House" - now I get it! On another note, all I can say is "Wow". You seem to have most every 20mm dog known to man, with the possible exception of the Parf's. Getting any use from the Rip Dogs? Thanks for posting the photos, you made good use of the 80/20 hanging on the MFT, much better than I have. I'm going to copy your TS55 shelf, mine got drug off the MFT yet again last week by the hose. Luckily no damage so far but it is only a matter of time. Also, your shop is waaaaayyy too clean/bright/organized.... I'm jealous. My, your naivete is astonishing. When I last counted there were at least 16 breeds (purebreds) plus at least two half breed varities of dogs in use by foggers. My position as not-so-special assistant to the 3rd Deputy Undersecretary of the FKCoA (Festool Kennel Club of America) requires me to maintain a significant, but incomplete, collection of breeds. As you may already know, the FKCoA was founded to honor our one true leader, the right honorable Grand Master Breeder, QWAS. Unfortunately Master QWAS seems to have gone over to the non-dark side with the recent announcement of dogs in a multiplicity of vivid colors. Yes, I do use your Rip Dogs when when I need to make longer cuts over about 40 inches. Very useful then. When even longer cuts are needed I happily use your parallel guides on MFT extensions copied from you. (against the wall in the far rear of the photo). Best part of my shop: Step out garage door to the North for a view of the Bookcliff Mountains, the Grand Valley, and the Grand Mesa. Step out the other door to the South for a view of the red rocks of the Colorado National Monument. The Bookcliff Mountains et al places you around Grand Junction? Gorgeous country. I chased a girl (caught her, I'm happy to say) from Nevada to NJ via PA, so I am living somewhere I never expected to find myself and missing the high desert. At least we have a great beach, something about 10,000 shoobies realized as they have just descended upon us for the long weekend. Everyone enjoy the holiday weekend, and remember those who sacrificed. Dave a quick question. Could you elaborate what kind of base you use underneath the incra unit to attach to the MFT/3 ? It looks like the Precision Plate from Precision Dogs. Yes, Precision Plate from Precision Dogs. Nice product. would the 10 profile fit as well? 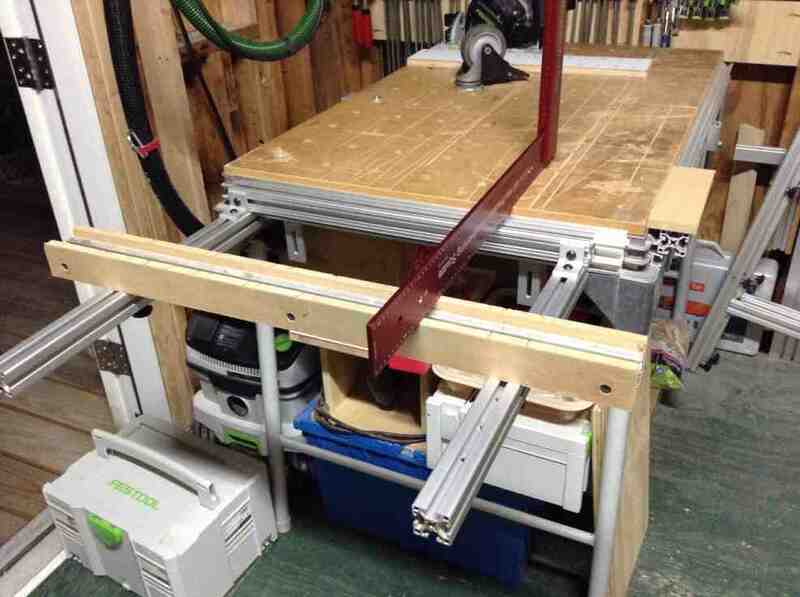 i'm so happy i just stumbled upon this thread as i'm outfitting an incra positioner and router table, with designs on attaching my contractor table saw to the MFT to maximize the precision of the positioner. of course money is an option, but when you are fitting expensive parts together, it hardly seems logical to scrimp on the joinery!? Got a deal on a DeWalt sawhorse/saw stand ($89 @ Lowes & also on Amazon Prime) and mated it up with the 80/20 extension arms I use so much. Turned out to be a great work support for quickie jobs, like cutting some brick outside to keep the nasty dust out of the shop. Best part is it sets up in 60 seconds, and is totally portable. I have the longer DeWalt miter saw stand also, next time I break down plywood I am going to try it with 4-6 of the 80/20 extensions. What series/size extrusion are you using? Is it 1515? Yes. 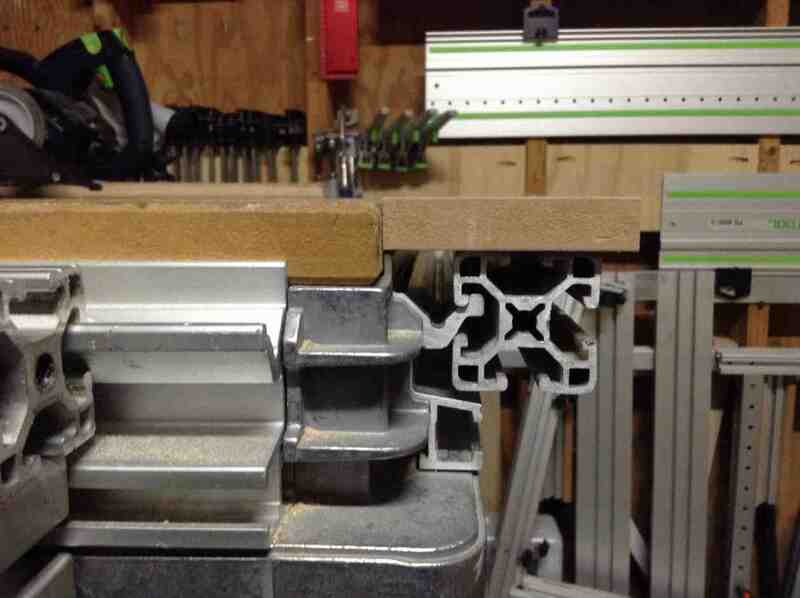 1515 and 4040 fit the Festool clamps with room to spare. They will just fit into the 3030 but you have to file/grind a smidgen off each clamp first. 1515 ULS is the best fit/lightest option. Has anyone submitted as custom machining request to 80/20. Im just a sketch up guy but they say you can submit a sketch if needed. Anyone who has, would this pass the requirements? Yes, I have done it. What you have drawn is fine. If they have questions, they reach out via phone or email. How did you mount the Kreg Clamp. After a number of fits and starts, I have most of my 80/20 system together. As much of it is the same (extrusions and such) as everyone else has done, I'll just concentrate on what I did differently and why I use the word system to describe it. The basics are I used 40 series extrusions and carrymaster casters. On the main table I have a full shelf underneath the top to allow access to the underside of the top and to keep items I'm using at the time. For the shelves below, I chose to keep them open with the drawer glides attached directly to the extrusions. 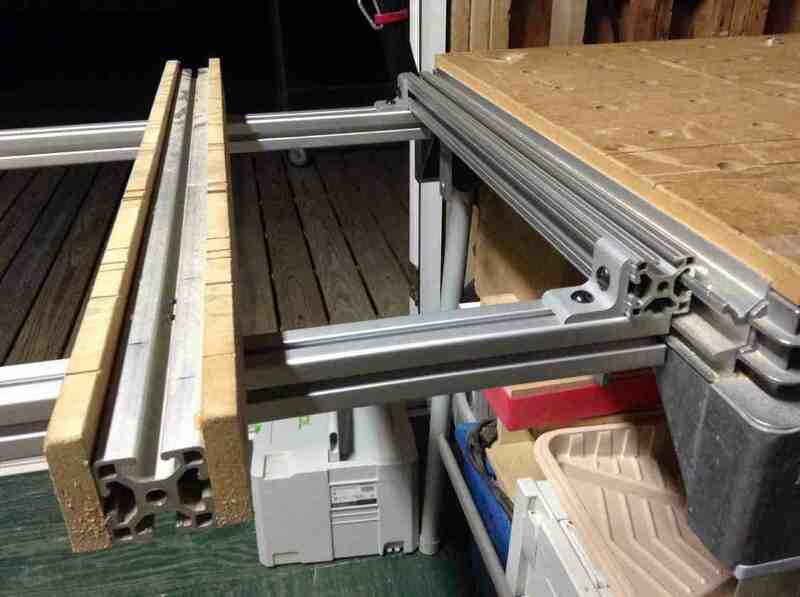 They become structural members as if the worktable needed to be any more stable. Eventually, I'll probably make drawers to go in the center section. This image shows the connectors I used. The m4 screws and drop in T nuts are to mount the drawer slides. I mainly used the end fasteners on the right wherever a fixed connection was needed. I used the anchor fasteners on the left when a piece of extrusion might need to be moved or added temporarily (you'll see what I mean in a few minutes). I used the panel brackets to support the top. This is the main feature I hadn't seen anyone else describe using. Here is a more open look at the second unit I built which has the same long length as the first but is only half as wide. You can see how the panel brackets are attached. To get the top to sit up from the extrusions, I built a frame from 3/4 ply and used loose dominoes as connectors. 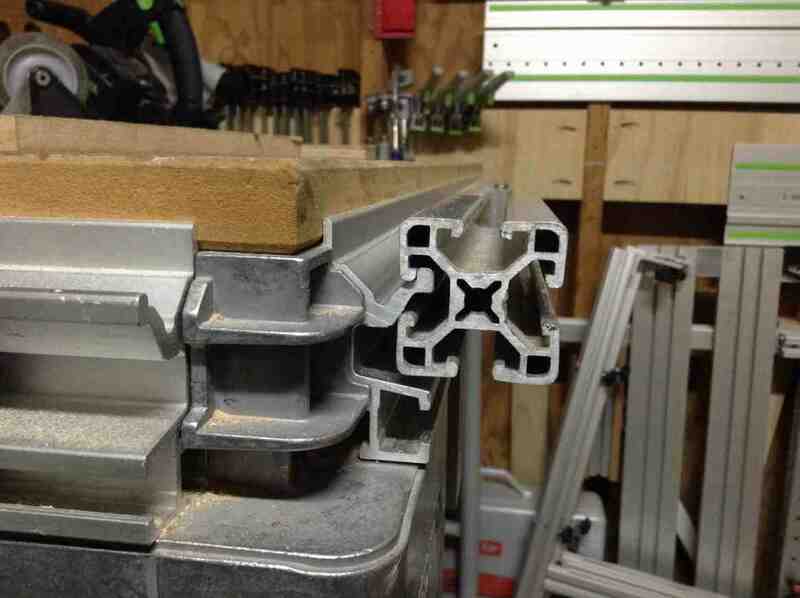 Then I cut the top to the exact dimensions of the extrusion arms, drop it in and tighten the connectors. I might later directly attach the top but so far it hasn't been necessary. The rest of this is talking about how I finally made the tops. The first change I made was to make the first set of holes in jig boards instead of on the blank itself. I actually drilled both boards at the same time and flipped one. One other difference from what others have done is that I wanted the first row and column to be exactly 28 mm from the edge (more on that later). I'll also show what the 32mm offset shelf pin holes are for. In this step and most others in making the top I don't think I can possibly overstate the importance the Incra precision T-rule has been to me. It has become a go-to tool. Here is my setup for drilling the top. Keeping the jig precisely aligned was critical so I used three bar clamps so I could always have at least two attached at all times. Probably the most controversial (heretical?) thing I did was to precisely drill a hole in the rail to fit the pin hole in the jig to get that 28 mm distance from the side. I used this as a coarse adjustment that I refined later. 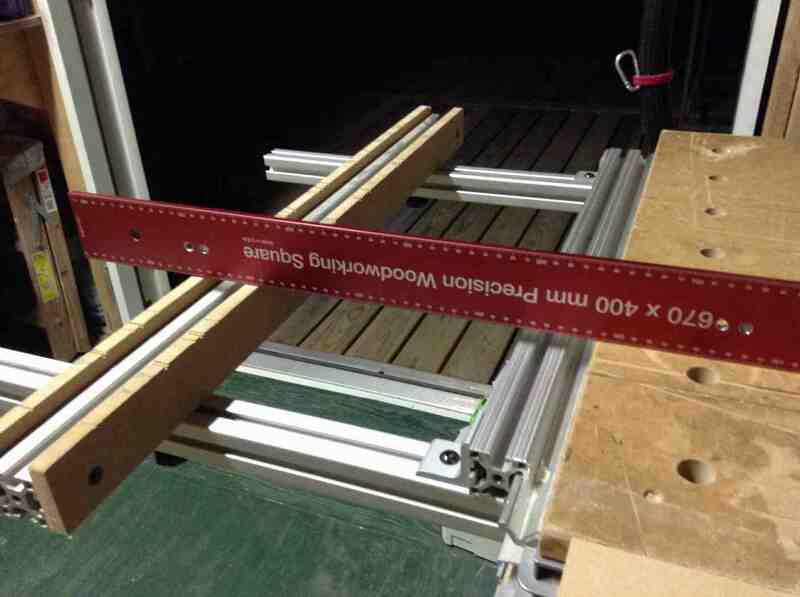 I also couldn't overhang the side guide holes to use the Qwas rail dogs and keep everything stable while drilling. So I used these threaded sleeves I got from John at tool improvements. They let me work on a flat tabletop. I don't know of anyone currently making these but as they make excellent rail pups I would expect that any of the current dog suppliers could make a set. For the drilling operation I used three bits. The first is a Whiteside 25/32, second the Festool 20 mm, and finally a pin I had on hand which is part of the Micro Fence circle jig. This made for a lot of bit change out during the process but as they each used a different collet, the process went fairly smoothly. At the start of each row I used the centering pin to make a fine adjustment then clamped the rail and removed the shelf pin from the rail. I used the Whiteside bit which was slightly undersized to remove most of the material. I found best results at not drilling completely through with this bit even using a backer board. I have a bias toward using a 1/2 inch shank when drilling through thick material. I then used the 20 mm to size the holes and make a clean exit through the board. Then wash, rinse and repeat and you have a board full of holes. Now I have two tables, one with a holy top and one without. Here comes the system part. By simply using two more pieces of extrusion and a second drilled top flipped with respect to the other, I now have a top that is a little over 4 by 8 feet. Looking down the line you can see what I was hoping for. First, it passed the square test. Second the other thing I was trying for worked as well. If you had been doing the math you would have seen that 28 mm times two plus a 40 mm extrusion gives a 96 mm hole space between tops. The only thing I had to demonstrate this was this part from my MFT 1080s. Now it is time to get to work. But as you can see, the next top I build will be much easier. Sorry this was so long but I hope you found the read worthwhile. Awesome job! Thanks for documenting it so thoroughly, the text/photos make it a cinch to understand exactly what you did. I have nowhere near the space to work with but am hoping to get back to my own, much smaller, 80/20 MFT project soon. Thanks for sharing, you are going to love working on that setup. The main reason I started on this project is that I consider my workspace small as well, around 16x16 feet. I don't intend for the large unit shown above to be set up very often. The small table and another I have planned that has the same width as the small one but the length of the short side of the main table will replace the ugly white thing shown in some of the shots above. I also plan to put my planner and possibly some other smaller tools on their small table tops. 80/20 refers to their product as being the industrial erector set and I hope to take advantage of that to roll together what I need at the time and leave them against the wall when I don't. This is however turning into another addiction. @ 10 by 12 outside dimension I am constantly struggling to find a place for [insert tool type here]. Seriously though, it has made me think thru what I really need to do the work I want to. I started w/ Festool when we moved to this house, going from a 800 SF shop to this little shed. Forced me to get rid of all my stationary tools other than a couple of small benchtop items. One way I made it work larger is having the outside deck at the same height, weather permitting I can roll everything outside. Awesome build! It is hard to tell from the pics but it doesn't look like you have use of the t-tracks. Do you have a plan for that or is it not a concern for you? I agonized over that part of the setup for quite a while. In the end I had to have the vertical slots in the legs available to be able to add the middle section. You can see that in the next to last picture. To make up for that I stocked up on what they call roll-in T-nuts especially the ones with a shoulder and a ball spring. And as I talked about with the drawer slides I use drop in T-nuts that twist to lock. This lets me add things after final assembly. Among other things, I hope to add a Moxon vise to one end of the main table but still be able to remove it. My 16x16 is also outside dimensions with six inch walls. Makes me feel squeezed in when I think of it that way. 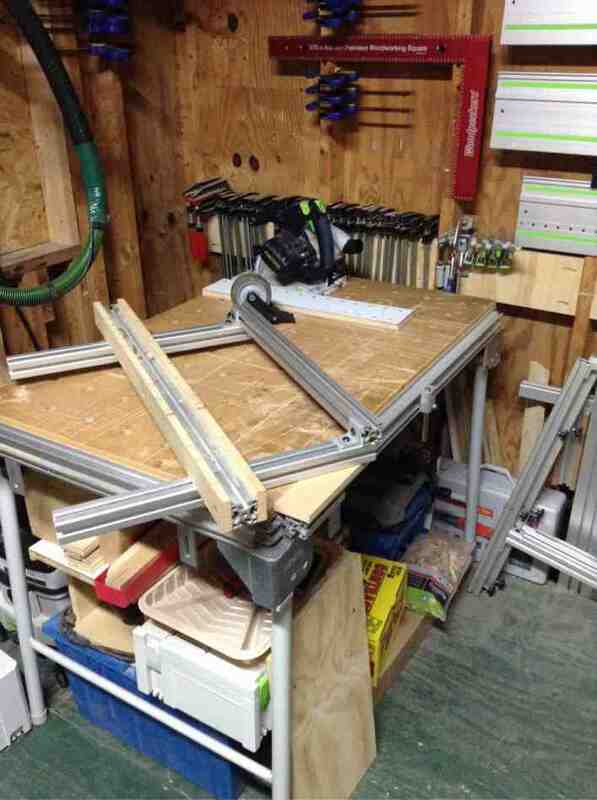 I also do without a table saw and made the tables so beefy so I can do hand planning and the like on them as well. Toying with the idea of combining the 2 Dewalt horses with more/longer extension arms and making an "L" shaped work area.